A couple of weeks back we went to the garden centre to grab some little plants for a terracotta trough for the outside windowsill. There’s nothing at the front of our house. We live in an Edwardian semi in the centre of a village. Our driveway would have originally been a little garden, maybe with a wall and gate, but it was paved over many years ago. All the greenery is at the back of the house where there’s a 120(?) ft garden which I have slowly been demolishing and making my own. So the front has largely been neglected. 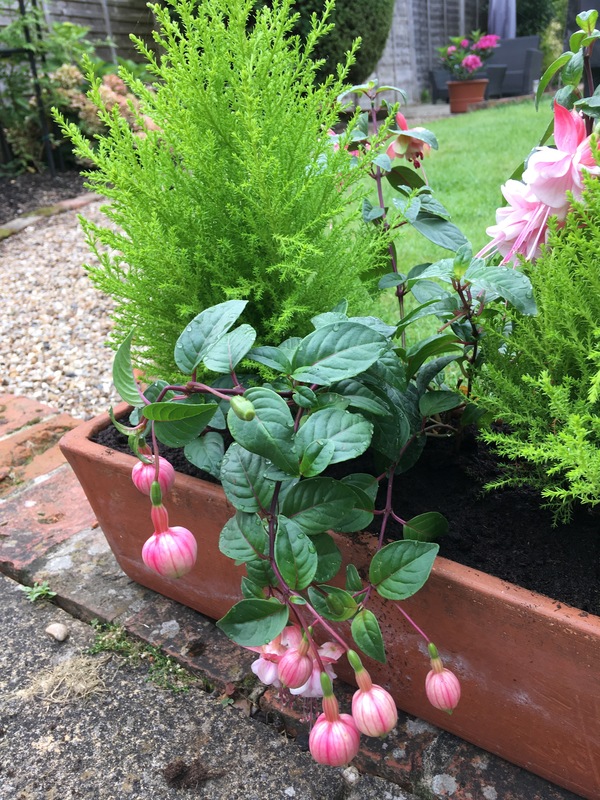 A few months ago my mother gave me a terracotta trough planter that fits perfectly on the centre windowsill of our bay window so I decided I should plant something in it and bring a little softness, in the form of greenery and flowers, to the front of the house. I’m not really into hanging baskets so this seemed like a good compromise. I’m also not really into changing the plants whenever the seasons change. I simply don’t have the time, the garden takes enough of my energy as it is! So I wanted something low maintenance and evergreen. Also, as I’ve mentioned before, the garden gets all the sun, so I needed something at the front that doesn’t mind partial shade. I had my heart set on those mini trees! You know the ones, I don’t know their proper name. I dragged my husband round the garden centre where he’d hold up every green tree-like thing and I would call out “No! That’s not the mini tree I wanted!” And he’d quietly wish for my early death under his breath. Probably. Eventually he came up trumps and I bought three mini trees for the trough. 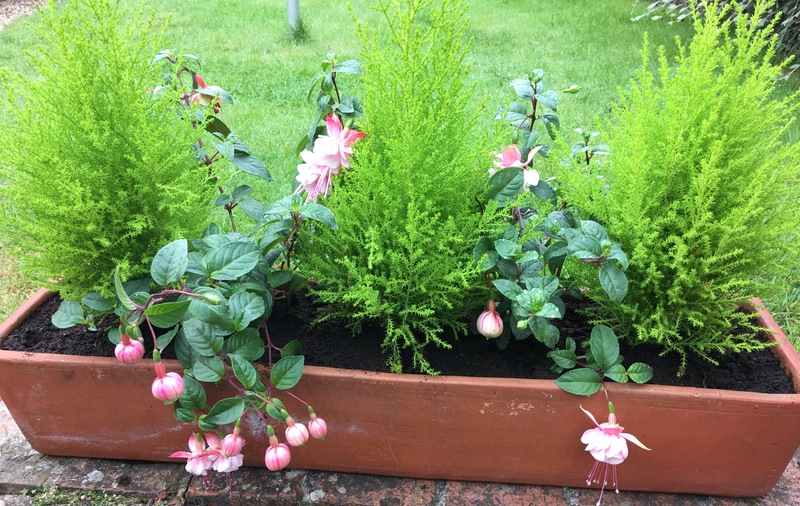 I planted a couple of semi trailing fuschias in between them. They’re pretty hardy but when they inevitably die I’ll probably just leave it bare and let the trees grow to fill in the gaps. Or perhaps plant some mini bulbs? Here it is! Albeit on the patio not the windowsill.